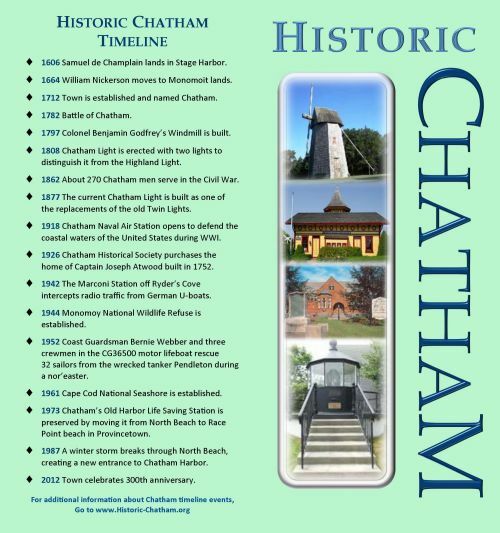 The Historic Chatham tri-fold brochure contains a Historic Chatham Timeline, shown in the image to the left. The timeline list is reproduced below, with references for learning more about each point on the timeline. 1606 Samuel de Champlain lands in Stage Harbor. 1656 William Nickerson buys land from Sachem Mattaquasson, and in 1664 moves to Monomoit lands. 1712 Town is named Chatham, after Chatham, England; the Crown declares Chatham a town with all the rights of incorporation. 1782 Battle of Chatham Harbor, involving local militia and British privateer. 1797 Godfrey Windmill is built. 1808 Chatham Light is erected with two lights to distinguish it from the Highland Light. 1862 About 270 Chatham men serve in the Civil War. 1877 The current Chatham Light is built as one of the replacements for the old Twin Lights, which were at risk of falling into the sea. In 1879 the old South Tower did fall, and the old North Tower followed into the sea in 1881. 1918 Chatham Naval Air Station opens to defend the coastal waters of the United States from German U-boats during World War I. Two planes are deployed, but the bombs they drop are duds. 1926 The Chatham Historical Society purchases the house built in 1752 by Captain Joseph Atwood. 1942 The Marconi Station off Ryder's Cove intercepts radio traffic from German U-boats. 1952 Coast Guardsman Bernie Webber and three crewmen in the CG36500 motor lifeboat rescue 32 sailors from the wrecked tanker Pendleton during a fierce Nor'easter. 1973 The Old Harbor Life Saving Station is moved from North Beach to Race Point beach in Provincetown. 1987 A winter storm breaks through North Beach, creating a new entrance to Chatham Harbor opposite the Chatham Light. 2012 Town celebrates 300th anniversary; 13 historical plaques placed.